The “capitulation” in gold that drove the metal to its worst January in 14 years may be ending as escalating violence in northern Africa spurs demand for a haven and after a key technical indicator held. Futures traded on the Comex exchange in New York jumped 1.7 percent on Jan. 28, the most since Nov. 4, as thousands of people took to the streets of Egyptian cities to protest the 30- year rule of President Hosni Mubarak. Gold earlier rebounded off its 150-day moving average, an indication the metal may surge 21 percent to a record by the end of June, according to technical analysis by the Hightower Report. While futures fell as much as 8.1 percent this month, they are still 20 percent higher than a year ago. 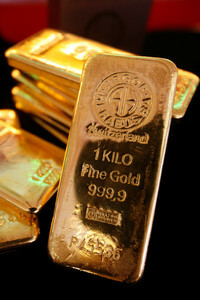 The metal has risen for 10 consecutive years in London trading, the longest winning streak in at least nine decades. That’s attracted investors including John Paulson’s Paulson & Co. and George Soros’s Soros Fund Management LLC. Paulson has denominated some share classes of his funds in gold, something that at least doubled their gain last year relative to the dollar-denominated shares, according to a performance report sent to clients this month. Gold’s rebound from the 150-day moving average of about $1,306 is a sign that prices are poised to rally, said David Hightower, the president of the research firm based in Chicago. The metal may climb to $1,630 by the end of June, he said. Prices rebounded from the 150-day moving average three other times in the past year, data compiled by Bloomberg show. The last time gold traded near the average was in late July. Since Aug. 1, prices have advanced 13 percent. They touched a record $1,432.50 on Dec. 7. The metal has not fallen below the average since January 2009. The metal’s 14-day relative strength index, a gauge of whether a commodity is overbought or oversold, was at 31.7 on Jan. 27, the lowest level since October 2008. Some analysts view a level of 30 as a sign that prices may be poised to jump. It was at 38.6 today. In technical analysis, investors and analysts study charts of trading patterns to forecast changes in a security, commodity, currency or index. On Jan. 28, gold futures for April delivery rose $21.90 to $1,341.70 on the Comex as stocks worldwide plunged the most since November because of the violence in Egypt. Earlier, the most-active contract touched $1,309.10, the lowest since Oct. 1. The metal has dropped 6.4 percent this month and traded at $1,330.30 at 11:37 a.m. in New York. Gold fell this month as hedge funds cut their bets on higher prices. In the week end Jan. 25, three days before prices rebounded on the violence in Egypt, net-long positions dropped 3.6 percent to 129,664 contracts on the Comex, the lowest since May 2009, U.S. Commodity Futures Trading Commission data show. It was the fourth consecutive weekly drop, the longest decline since November. The directional movement indicator study, or DMI, and the average directional index show that gold’s downtrend has been strengthening this month. The DMI was invented by J. Welles Wilder Jr. to evaluate the strength of a current trend. The ADX, as the average directional index is known, is the moving average of the DMI. The daily DMI/ADX indicators show there had been “directional strength on the downside,” said Stephanie Aymes, a cross-commodity technical analyst with Societe Generale SA in London. Still, “the downside is limited in light of the weekly RSI,” she said. Investors in exchange-traded products backed by gold also reduced their bets. Combined holdings across ETPs from 10 providers were at 2,033.8 metric tons by Jan. 28, the lowest since June, according to data compiled by Bloomberg. That’s still more gold than all except four countries’ official reserves, data from the World Gold Council in London show. This month’s decline in prices has precedents in the decade-long bull market. Futures slumped about 8.5 percent in the five weeks to July 28 and almost 15 percent in a two-month stretch that ended in February 2010. There was also a 34 percent retreat from March 2008 to October of that year. Prices have more than doubled since then. “The short-term negative sentiment in gold will be dramatically curtailed,” said Jon Spall, a product manager for precious metals at Barclays Capital in London, who expects the commodity to reach $1,700 this year.